The United Nations on Saturday condemned a "direct attack" on its peacekeeping mission in South Sudan after a government soldier shot and wounded a Nepalese peacekeeper. The shooting came three days after South Sudan's rival sides signed a peace deal to end the five-year civil war that has killed tens of thousands of people. 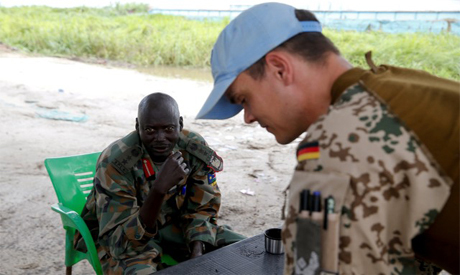 The South Sudanese soldier fired into the air near a U.N. convoy in the town of Yei before shooting at one of the vehicles, the U.N. statement said, adding that the peacekeepers could not return fire because of the risk of hitting civilians. The U.N. mission chief, David Shearer, called the attack "unacceptable" and urged South Sudan's government to bring its forces under control. Government troops earlier Saturday fired about 50 shots close to the U.N. base in Yei, the U.N. statement said. South Sudan military spokesman Lul Ruai Koang told The Associated Press that the government takes responsibility for the shooting and that someone from the national security service, not the regular army, opened fire. "I want to make it crystal clear it was an individual act and not the SPLA. This doesn't represent the SPLA or national security," he said. The shooter has been arrested, he added. The attack on the convoy came a day after fighting broke out in Central Equatoria state, the first reported clashes since the peace deal, with the opposition accusing government troops of storming bases in Lainya and Kajo Keji counties. South Sudan's military said the attacks were instigated by opposition forces trying to reclaim territory. Many international observers have expressed skepticism about the new peace deal signed Wednesday by President Salva Kiir and the head of the armed opposition, Riek Machar. Under the power-sharing arrangement Machar will once again be Kiir's deputy — an arrangement that sparked the civil war in December 2013 when supporters of the two men clashed. An attempt to return Machar to the post in 2016 failed amid fresh fighting. In his first major statement since the peace deal, Kiir on Saturday acknowledged that many South Sudanese remained skeptical but said "I want to personally assure you that the agreement we have signed has ended the war. ... This government will not let you down."